Posterior hip pain can have a number of causes, with referral from the lumbar spine, SIJ and hip, along with local structures such as the hip joint, gluteals, glute tendons, proximal hamstring tendons. How can you identify the structures involved in your patient's posterior hip pain? What tests can you perform in your objective assessment to assist your treatment? What is the best way to treat the glutes if they are the involved in your patient's pain? 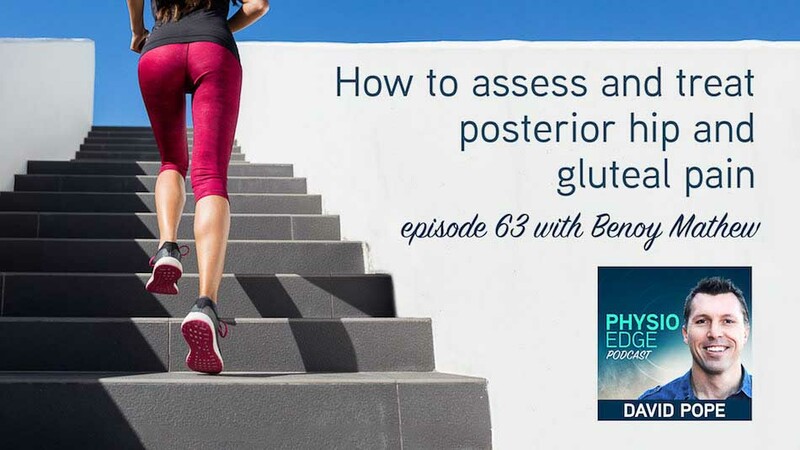 In episode 63 of the Physio Edge podcast, Benoy Mathew and David Pope explore how you can improve your diagnosis and results with posterior hip pain. What are some of the common causes of posterior hip pain? What area of symptoms will patients with GT report? What are the pattern of symptoms for GT? How can we treat GT? What is deep gluteal syndrome? What muscles can be involved in DGS? How can we differentiate it from Gluteal tendinopathy? What tests can you perform to confirm or exclude DGS? How does the treatment for DGS differ to GT? Benoy is presenting a free webinar with Clinical Edge on "How to assess & diagnose posterior hip and gluteal pain", that complements this podcast, and takes you through the common sources of hip pain, how to identify hip and lumbar spine red flags, and demonstrates exactly how you can perform an assessment to test and differentially diagnose the structures involved in your patients pain.